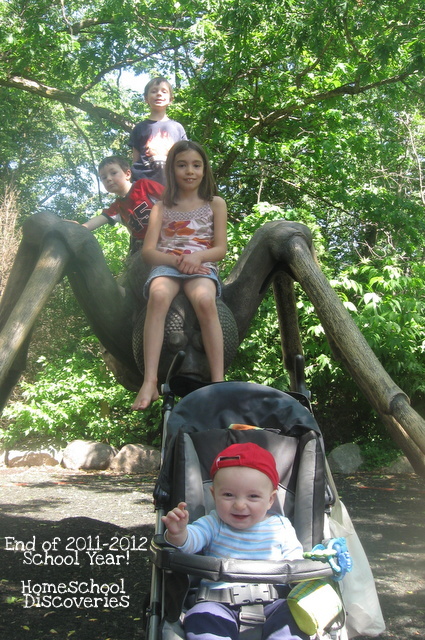 Ah, the lazy days of summer…well, as “lazy” as they can be with four young kids involved! Today we enjoyed the second “regular” day of our six week summer break from regular academics — a.k.a. a day that would have been a school day had we not already started our break! Reading books is still very much a part of our day, however. Mr. E is eager to keep progressing in his reading skills. I gave him the challenge last week to read all 10 books in the Now I’m Reading Level 2 set “Amazing Animals” by Nora Gaydos in order to “earn” a trip to a neighborhood bakery for an Angry Birds cookie. He read the last four books today! Even though they were overpriced (so much so that the clerk kept apologizing for how expensive they were! ), I bought one for each kid as a fun celebration of a reading goal accomplished. Our local library does not offer much in the way of summer reading programs — they have volunteers doing fun crafts with kids on many summer days, but no prizes for accomplishing reading goals like some libraries have. We’ll participate in a couple of book-store sponsored summer reading programs that involve the kids tracking the number of books or number of minutes they read each day. For Miss M I created a “Genre Challenge” inspired by a similar challenge printable at Walking By the Way. We haven’t decided on a reward yet, but her challenge is to read a dozen books each with a different genre or characteristic, many of which are not things she would select on her own (such as a non-fiction book about a science topic or a fiction book with a male main character). I’ll also have Miss M keep a reading log for the first time of all the books she reads. That’s a habit I want her to start doing all the time, not just this summer! Just since Friday afternoon when I declared the beginning of summer break, I think she has read at least eight books! Besides the bookstore reading reward programs, I may set up a few more mini-challenges for Mr. E similar to the challenge that earned him the Angry Bird cookie. He is pretty motivated to practice reading, but I know that these early weeks or months of needing lots of practice, practice, practice can get tiring…so a few extra motivators certainly won’t hurt. I’m diving into a reading challenge of my own (inspired by this blog post), though it may be a true challenge to complete it. I started a Bible-in-90-days reading plan in my YouVersion app on the iPad. With about 100 days from the day before Memorial Day to Labor Day, that would give me 10 potential catch-up days. Even with that, I’m not sure it will be very easy to find the time to really read something like 16 chapters a day. But given that I had gotten into the bad habit of reading a chapter or two a day to the kids and not reading any further on my own, even keeping up partially with this kind of reading plan is an improvement. As much fun as it would be to read facebook and light novels while I “supervise” the kids in the bathtub-depth backyard pool, I know doing some extra Bible reading first will be a good thing for my spiritual life. 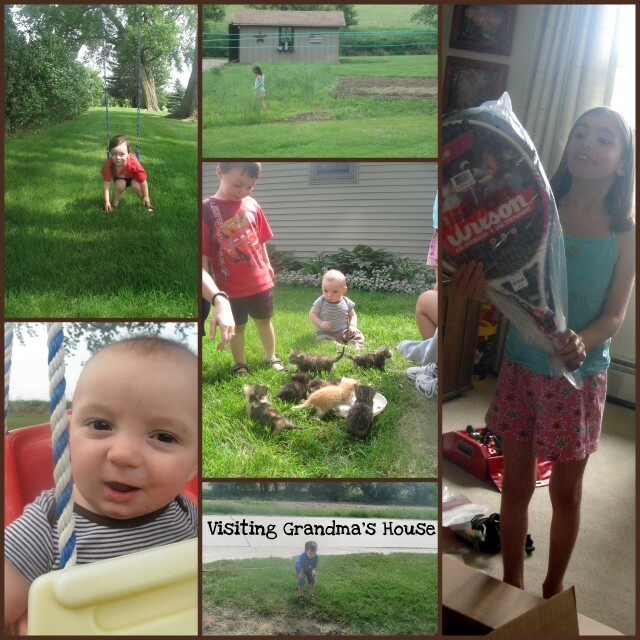 The kids love going to Grandma’s house (Tony’s mom) and experiencing the wide open space of the Iowa countryside. 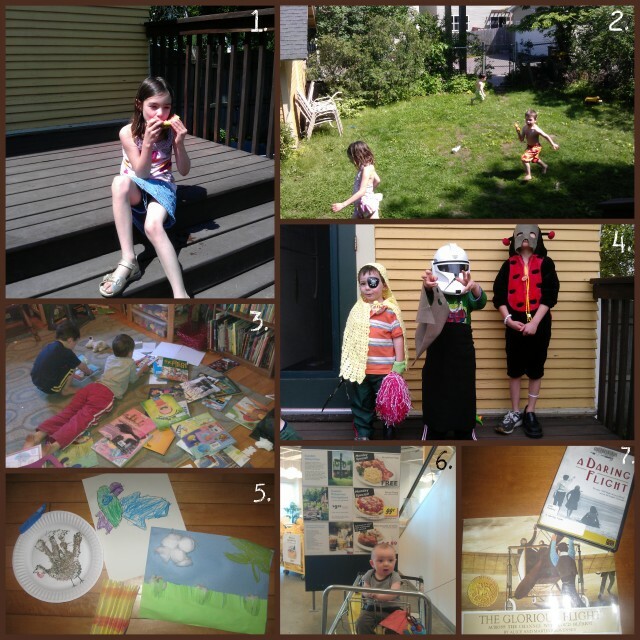 The kids played with their cousins, we celebrated a family graduation and Miss M’s birthday. She is super excited to have her own tennis racket! Miss M wanted a field trip day for her birthday, so after birthday donuts and pastries for breakfast (our family tradition) and a “reveal” of her birthday present (a small trampoline) we headed for a day at the Minnesota Zoo! We ate Miss M’s birthday dinner of choice and had a fruit tart/pizza for dessert! 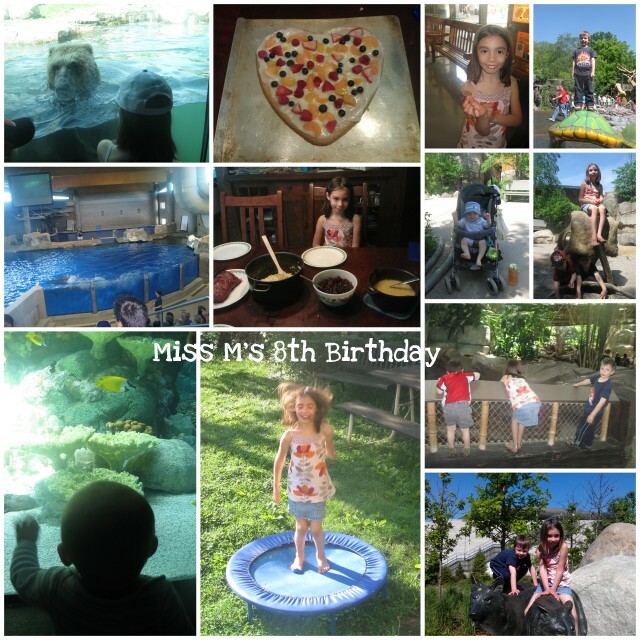 What a fun day for a wonderful 8 year old! 1-3: Miss M finished her Early Flight/Famous Aviators lapbook. This was her primary schoolwork this week. I really wanted her to finish this up before our summer break, because I was pretty sure that if we didn’t get it done this week it might not get done at all! 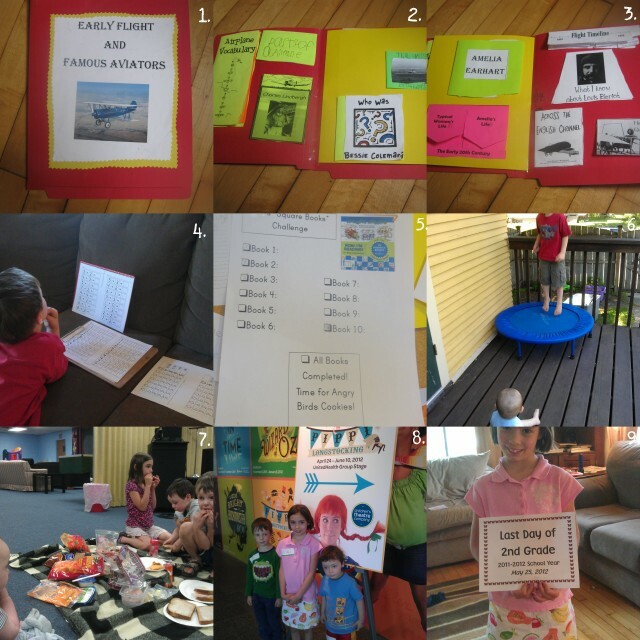 4-5: Mr. E did at little bit of math at his request, and started a new “reading challenge.” Mr. E recently saw a sign at a bakery advertising “Angry Birds” Cookies (and we know this boy loves Angry Birds!). I told Mr. E that if he completed a reading goal we decided on together, we could all go to the bakery for cookies. We decided that he would read all 10 books in the “Now I’m Reading” Level 2 set “Amazing Animals” by Nora Gaydos. He’s already finished four books from the set! 6. We discovered Miss M’s new trampoline has a nice side benefit. Have a crabby baby? Just set him in a spot on the deck to watch the other kids taking turns jumping on the trampoline. No more crabby baby! 7. We had our last co-op meeting of the year on Thursday morning. We were supposed to head to the park for a big picnic after co-op…but we got rained out and had an indoor picnic instead. After the picnic, we met up with my mom for a brief belated celebration of Miss M’s birthday (one of her gifts from Grandma Karen was her very own sewing box!) and a new summer haircut! (Check out the 4 inch difference in length in Miss M’s hair in the earlier pictures to pictures 8 and 9!). 8. We went to see a musical performance of Pippi Longstocking at the children’s theater on Friday morning. We’ve been looking foward to this for months, and it was indeed a great show! 9. Today (Friday) was our “official” last day of school before a six week summer break. We’ll start adding subjects back in after the 4th of July. We celebrated the end of the school year with a family ice cream outing tonight. Tony asked the kids what their highlights were from this school year. Mr. K said, “seeing People Longstocking” (as he was calling it all day long). Mr. E said “learning to read!” and Miss M said, “Finding a new spelling curriculum.” (That really surprised me!). I’m looking forward to a three day weekend filled with projects around the house, BBQs and 50% off sales at the local thrift stores! Enjoy your holiday weekend! 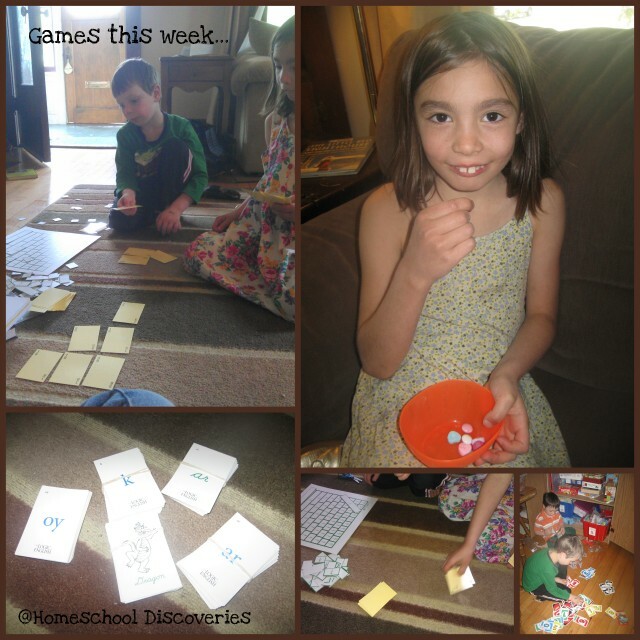 I’m linking up with Collage Friday @ Homegrown Learners and the Weekly Wrap Up at Weird, Unsocialized Homeschoolers! We’re just finishing up a delig ht-directed unit study on the history of flight and famous early aviators. The kids’ interest in this topic was sparked by watching a PBS/Nova video on Netflix streaming about the Wright Brothers. Miss M wanted to focus primarily on the lives of famous pilots (rather than learning about the planes themselves), so most of our book choices were biographies. I’ll highlight three we particularly enjoyed — two about Amelia Earhart and one about Louis Berliot. You Can’t Do that Amelia is an easy picture book biography that I read aloud to the boys (several times, at their request! ), and Miss M read alone. This book gives brief snapshots of Amelia at various points in her life — from a young girl who wanted to build her very own “roller coaster” to a woman who wanted to fly alone across the Atlantic. Many people said, “You can’t do that, Amelia!”. But she always proved them wrong. This book stops short of her famous last flight, and doesn’t mention her mysterious disappearance, so it’s a good choice for a younger or more sensitive audiences. Amelia Earhart: The Legend of the Lost Aviator is also a picture book biography told in story format, but in much greater depth than You Can’t Do That Amelia. I read this aloud to Miss M, and the boys listened in at some points. Legend of the Lost Aviator goes into more detail about Amelia’s life in an engaging way. I felt like it treated the instabilities in her family life (including her parent’s divorce) in a tactful way. This biography covers many of the major events in Amelia Earhart’s life, all the way through her disappearance and efforts. The Glorious Flight is another picture book biography that all three kids enjoyed. This was my first introduction to Louis Berliot, the first person to fly across the English Channel. Berliot had many unsuccessful attempts before finally creating a plane capable of flying the channel. The Glorious Flight has beautiful illustrations (It won a Caldecott Medal) to show his various aircraft. This book is a Five in a Row book selection, and I borrowed the appropriate volume of Five in a Row from a friend with the idea of using it as a jumping off point for more in-depth study of this book with the boys. It didn’t work out that way, but I did appreciate reading the ideas in the Five in a Row handbook for discussion and observation points as I read the book to the kids. I am happy that I bought a copy of this book for our permanent collection! How Airplanes Work – an easy to understand intro to the subject. The boys liked it! DK Flight – Lots of pictures and details on planes through the years. We used it for browsing. Charles Lindbergh (Compass Point Books) – A straightforward, factual-style biography that Miss M read on her own. I think with a bit of searching we could have found a more interesting yet age appropriate book on Lindbergh. Brave Harriet – An easy, picture book style biography of Harriet Quimby, the first American woman to hold a pilot’s license and the first woman to fly the English Channel. Fly High — Picture book style biography of Bessie Coleman, the first African American woman pilot. The Wright Brothers: A Flying Start – an even more in depth, factual style biography of the Wright Brothers. Miss M skimmed portions of this one but didn’t read the whole thing. 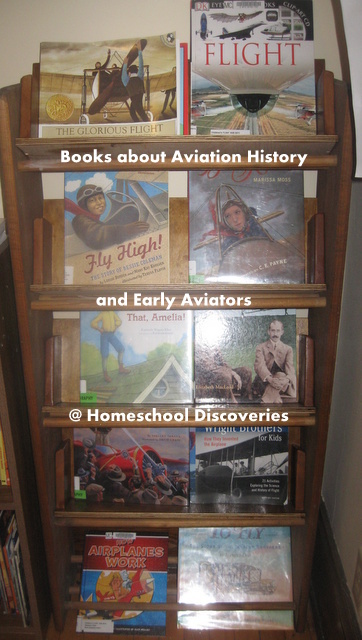 I got into the spirit of learning about early aviators with a book selection of my own. While browsing for books for the kids, I noticed that The Big Jump: Lindbergh and the Great Atlantic Air Race was available for library checkout in Kindle format. I learned so much in reading this very interesting book. I previously had the vague impression that Lindbergh was the first person to fly the Atlantic. He was actually the first person to fly the Atlantic solo and the first person to fly from New York to Paris. Other daring aviators made the jump on shorter routes before he made his Big Jump. The Big Jump chronicles the daring early aviators (many of whom lost their lives) who made it their quest to fly the Atlantic as well as discussing Lindbergh’s flight in-depth. For math we use Right Start. Miss M completed a little over 100 lessons in level C during her 2nd grade year. We’ll pick up Level C right where we left off, and then move on to Level D. Mr E seems like a natural at math. We’ve informally used level A this year. I am currently planning on starting Mr E with Level B (also a starting point for Right Start Math), and seeing how that works out for him. If you want to read more thoughts on why we like RightStart, check out this post. For spelling (as well as some grammar/composition), we will be using the Logic of English Essentials curriculum. This is not exactly a continuation, since we’ve only been using it since mid-April. But once I bought it, I just couldn’t wait to try it out! We’ve done a few formal lessons, and will continue to learn/review the phonograms and play games during our six week break. This is a new curriculum, and judging from the search terms people are using to find my blog, readers want to know more about it! I’m hoping to post a review with a few more detailed (albeit initial) thoughts within the next week or two. Miss M will be using this curriculum fully, and I will be including Mr. E as best as I can. He will not be able to move as quickly as Miss M, so it might be a challenge to use it to its full potential with him this year. I don’t plan on doing any other formal grammar or composition/writing curricula with Miss M this year. My plan is to begin more detailed grammar study in 4th grade. Since Miss M findings writing to be very frustrating due to her difficulties with spelling, the composition exercises in LOE as well as copywork and incidental writing for history or science will be plenty until her spelling improves. If we see a marked increase in her spelling abilities and confidence, I may assign more writing. For phonics/reading with Mr. E, we’ll continue with Phonics Pathways, until it proves to be unnecessary or no longer useful. We’re currently up to page 95, and working on long vowel sounds. Of course, we do lots of practice outside of the Phonics Pathways book with easy-readers I have around the house or check out from the library. For literature/read-alouds, I will do as I did this past year and make a list from the many sources I’ve found to inspire book-list-making. I’ll make lists for read-alouds with Miss M at bedtime, read-alouds for the whole family (or at least the two older kids), and books I will ask Miss M to read on her own. I’ll be planning some of our choices to coincide with our history studies. For science, we will continue with Building Foundations of Scientific Understanding (BFSU). We are close to finishing Volume 1 (we may finish it this summer), and we’ll start volume 2 after we finish it. I haven’t written about BFSU on this blog yet, but I’m sure I will get to writing about it eventually. 🙂 Science is a family subject for us taught primarily by my husband. For history this year, I know we will study American history from the explorers and native people to sometime just before the Civil War. I know I want to incorporate a lot of literature. I know I want to use lapbooks/notebooks and maybe a few hands on projects or other experiences. I also know that I haven’t found any one curriculum or list or curriculum package that is just what I want… and I have spent hours researching the options! I’m not sure I’ve even found a spine or key text that I like. I am confident in my ability to put together a list of books, so if all else fails we’ll just do that. Currently, I am intrigued by “A Living History of Our World: America’s Story Vol. 1” by Angela O’Dell. But I haven’t gotten my hands on a copy yet to see if meets the many criteria I have for a US History text! Overall, I will be planning our history studies with Miss M in mind, but I am hoping for spine text that Mr. E can reasonably join us for, as well as asking him to join us for some read-alouds that he will find interesting. For Bible and character growth, I will continue to ask Miss M to read her Bible each day, and will aim to read the Bible to Mr. E (and Mr. K if he chooses to listen). Maybe before the year is out, Mr. E will be reading it on his own! I’ll also be adding in an assigned Bible study for Miss M. I bought a Proverbs Bible study for kids from B to Z publishing at our regional church conference this winter, but we haven’t used it yet. I think I will be having Miss M work though this workbook next year. At the MACHE homeschool conference I bought a few resources from Doorposts Books that I hope to worth through as a family the summer and into the next school year as well to continue building Godly character qualities into our kids! For handwriting and and copywork…I am wavering in my decision. Miss M has used A Reason for Handwriting Level C to learn cursive, and I have been pleased with it overall. So much so that I bought Level D for her continued practice and Level A for Mr. E to practice printing. Then I started to wonder if I wouldn’t rather assign cursive copywork to Miss M based on Bible verses I would like her to learn or copywork related to history or science. Also, the Logic of English Essentials curriculum recommends starting with cursive first, so I am not quite sure what I want to do with Mr. E. He already knows his manuscript uppercase and some lowercase letters. At first he wanted to learn cursive…now he’s not so sure. I’ll keep both books for now and think on it a bit more before fall. For preschool with Mr. K and some “fun” Kindergarten stuff for Mr. E, I’ll be using free printables from some of my favorite sites (I hope, if I can manage to get organized enough to do that!). I’m also mentally tossing around ideas about how to incorporate some literature based or topic based unit studies/delight directed studies. Despite their difference in academic ability levels, I think topic-wise Mr. K and Mr. E should still have a lot in common for their interests and types of books that will hold their attention for literature based studies. I’m not too concerned with actual “preschool” skills for Mr. K…if he learns a few more letters and numbers that’s great…if not well…he’s still only three and has plenty of time to learn! Health and P.E. are part of the Minnesota state requirements of what you agree to do if you are homeschooling. We fulfilled this requirement informally, through our co-op and through science lessons (in the case of health). I’m not sure if I’ll plan something formal for these subjects or not. I don’t have any formal plans as of right now for art and music. My kids do a ton of art and crafts on their own (as well as doing art at our co-op). I have materials on hand for art instruction if they ask for it. The jury is still out as to whether or not Miss M will begin piano lessons this coming year (we don’t even have a piano or keyboard yet, so it is a theoretical discussion indeed at this point!). I would love to incorporate more art and music appreciation into our homeschool, but I know from past failed attempts that it is easier said than done! I’m still pondering whether or not I want to make a formal attempt next year. The end is in sight! This is our second-to-last week of school before we take a six-week break from almost all schoolwork, though it was hardly a normal week! Miss M took the Iowa Test of Basic Skills on Monday and Tuesday. Minnesota is a fairly lightly regulated state when it comes to homeschooling — besides filing a minimal amount of paperwork each fall, students age seven and up need to take a nationally-normed standardized test. Any test is fine, as long as it gets done! Some families opt for an oral exam like the Peabody, some families hire a private tester to do a written test, some families purchase and administer a test themselves, and some do what we did — join with other families (in our case, from our homeschool co-op), to do testing in a small group situation. I wanted Miss M to feel comfortable with written standardized testing right from the start, so there’s less stress and change for her as she gets older and has to take tests that really “count” for something. And I knew I couldn’t administer a test at home. Besides the huge number of distractions in our house (well, three brotherly distractions! ), I’m not sure I could be fair and unbiased as a test administrator for my own child! Other than the time involved (3 hrs on 2 days this year, and it will take three days next year when she is a 3rd grader! ), the co-op testing situation worked super well for us. Miss M tested with one other 2nd grader, while I read a test to a 1st grader from another family (1st and 2nd grade ITBS tests have most questions read aloud). The boys got to hang out with all the other younger siblings who were not testing, with a few moms who were not reading or supervising a test. We won’t find out the results until July, but Miss M seemed confident and at ease about the testing process, so I am sure she did her best! We played games for quite a while on both Wednesday and Thursday (and maybe we’ll do that today too — we’ll see how things go!). The highlight of our game playing for the kids probably a game I created that they named “Phonogram Treats.” I showed the kids Logic of English (LOE) phonogram flashcards, and they got a piece of candy for saying all the sounds of the given phonogram correctly. We cheered on the three-year-old, Mr. K, for saying anything remotely close to a correct sound or letter name and made sure that with enough hints, he ended the game with plenty of candy in his bowl too. We also played a Logic of English game called Dragon from the LOE games book. Mr. E chose not to play with us and Miss M and we found this game was not quite so fun with only two players — but at least it was good practice. Miss M requested fraction games from the RightStart games book for our math game time. She decided after taking the Iowa test that she had “forgotten everything she knew about fractions”. 🙂 A quick review of the RS fraction chart brought it all back to mind, and we enjoyed “Fraction War” and “One”. Mr E played “One” with us (making rows of fraction cards to equal one), and it was impressive how well he was understanding fractions after just a short introduction to the subject and playing the game with us. Joan Cotter is so right — even Kindergarteners can understand fractions by playing games! 5. Artwork created by Miss M and Mr. E. Mr. E drew the toucan-like bird in the upper center of the picture. His drawing skills have taken a massive leap forward in recent weeks! I continue to think I don’t really need to teach these kids how to do art or drawing…they are so creative and talented all on their own! 6. Another week, another trip to Ikea to meet an out-of-town friend. Seriously, we had not been to Ikea for months, and now we’ve been twice in two weeks! This time we met a college friend of mine visiting from Colorado. The kids enjoyed afternoon treats and a movie in the kids area while my friend and I chatted! 7. Our flight unit study continues. This week read read about Charles Lindbergh (book not pictured) and Louis Berliot. I found a PBS/NOVA video about Berliot at the library that we all enjoyed watching together. Miss M completed a few more lapbook pieces as well. Later this afternoon we leave for a weekend trip to visit my husband’s family in Iowa and hopefully catch up with a few friends as well. As much as I would like to get a bit more school-ish stuff done today, I have a suspicion that today will be mostly consumed with errands and packing as we get ready to go. It never seems like it should take very long to just pack for a two day, two night trip…but somehow it always does! 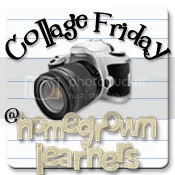 I’m linking up with Collage Friday @ Homegrown Learners and the Weekly-Wrap Up @ Weird Unsocialized Homeschoolers. I’m going to share about my two most recent bedtime read-alouds with Miss M for this week’s Read-Aloud Thursday, since only one of them was fully a read-aloud. Miss M and I read part of Baby Island together (maybe about half), but I “caved” and let her take the book to read much of it on her own. Phantom Tollbooth by Norton Juster is a language-lover’s delight. Milo, a rather bored-with-life boy, finds that a tollbooth has mysteriously appeared in his bedroom. There’s nothing to do but get in his toy car and drive through the tollbooth’s gate and see what happens next. Milo finds himself transported to a strange land with characters like Tock (a watchdog with a giant clock for a body), the whether man, the not-so-wicked-which, the Humbug, and police officer Short Shrift. Milo’s quest is to complete the seemingly impossible task to rescue twin princesses Rhyme and Reason and return them to their kingdom (where their presence has been sorely missed, due to the lack of their namesake qualities while they have been missing). I love puns and other types of word play. I would seriously consider putting up signs like this. Phantom Tollboth is full of verbal humor. I was a little bit worried early on in the book that Miss M would miss a lot of the humor by not being able to see how various names in the book are spelled as I read aloud to her. I showed her some of the names and explained a few jokes, but I found she was enjoying the book and finding it funny even without me doing this very often. After finishing Phantom Tollboth, we started in on Baby Island by Carol Ryrie Brink. We read and enjoyed Caddie Woodlawn (also by Carol Ryrie Brink) earlier this year, and I was interested in giving another of her books a try. I saw this title on one of the many book lists I have been browsing lately, and requested it from the library. In Baby Island, Mary and Jean are traveling on a ocean liner alone, heading to meet up with their father in Australia. They love babies and toddlers, so when the ship seems about to sink, their first thought is of the small children they have befriended. Through a series of miscommunications and mishaps, they end up alone in a lifeboat with four small children, ages 4 months to 2 years. They soon reach an island they dub “Baby Island” and begin the task of raising these four babies. This story was easily at Miss M’s reading level, and I wasn’t quite as enamored with the story as she was, so when she begged to continue reading the book on her own one night after our read-aloud time was done, I gave in and let her (usually I say “no” because I really want to share our read-aloud’s together!). This is truly a story for children (probably girls in particular) — Especially those who are enamored with babies and delight in the fantasy of living on a desert island with some cute kids to take care of. I, on the other hand, could sympathize more with how the parents must have felt being separated from their young children for so long (In the book, 12 year old Mary hopes the mom of three of the four kids is enjoying a nice vacation! ), and kept pondering how the 4-month-old could possibly thrive on canned mild and goats milk. Of course, no mention is made of having to wash out dirty cloth diapers! This story doesn’t have the universal appeal to all ages that many of our read-alouds have, but it was a fun story for Miss M to enjoy much of on her own. But I decided to go for something a bit more unique to us — My city Minneapolis, Minnesota and a unique celebration in our neighborhood for May Day. We love the many, many beautiful parks, lakes and trails in the city. Almost every park has a free wading pool! Many of the parks offer reasonably priced sports programs and other activities. 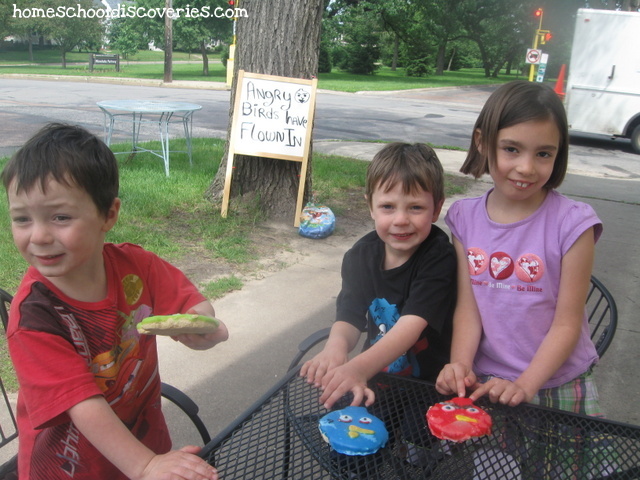 Miss M even did pottery classes at our neighborhood park last year! So many wonderful museums, historical sites and other attractions in Minneapolis and in the larger Twin Cities (aka Minneapolis, St. Paul plus their suburbs) metro area. Our huge downtown library with many neighborhood branches, plus the resources of the entire county library system. Enough homeschool groups, co-ops, classes and activities that you can really say there is “something for everyone” somewhere in the Twin Cities metro area. (I guess this can be a drawback in some ways as well — one family can never do everything, so I sometimes feel bummed that we can’t do many of the neat things I hear about! We are in a stage of life where it’s difficult to do too many organized classes and field trips…something that will change I am sure as the kids get older! With so many options even just for choosing a co-op, there’s the potential to spend hours doing research to find which one is “best”). Opportunities to be exposed to lots of cultural diversity. I’m sure this isn’t unique to Minneapolis, but I like the fact that my kids are playing at the park right along side kids speaking Spanish and kids from Somali families that may dress differently than we do…but they are all kids, just playing together at the park. If anything, I wish we had more opportunities to not just see a variety of people around us from various countries, cultures and races, but to really interact and get to know them (since in reality, most of the people we spend time with regularly still look a lot like us!). Within Minneapolis, we live in a neighborhood called Powderhorn Park (named after, yes, the park in our neighborhood!). It’s a fun, quirky and diverse area. 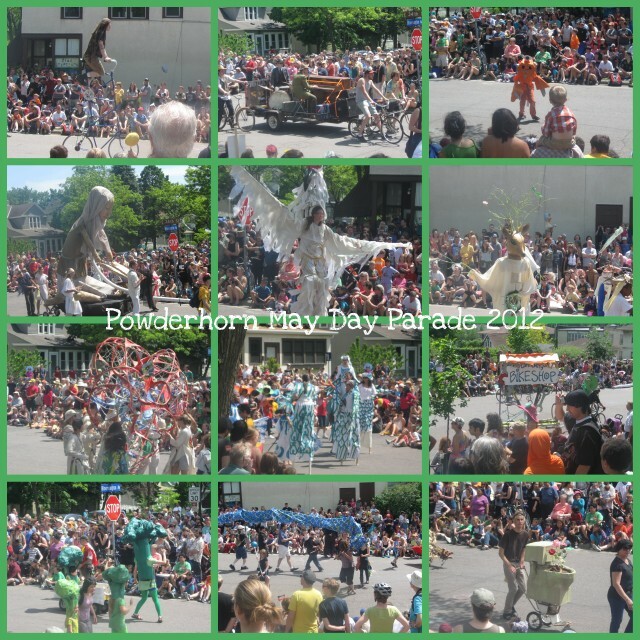 We have a really unique neighborhood celebration called May Day. It’s usually on the first Sunday of May. This year, it got rained out and had to be postponed to the next weekend (which was this past Sunday, on Mother’s Day). The May Day festival brings out tens of thousands of people from the neighborhood, the city, and well beyond. There’s a parade like nothing I’ve ever seen anywhere else, and a festival in the park that includes some of the “normal” stuff like food vendors and music…and also a pageant of sorts that celebrates the arrival of spring in a way that is, well, pretty pagan (with elements of things like bowing down to the sun). The pageant is a bit much for us, but the pagan element of things in the parade is a bit more subtle. We feel like we can enjoy the beauty of the artwork in the parade, appreciate the diversity of cultures, opinions and world views represented, and use it as a good opportunity to teach our kids how to respect and appreciate all they see around them in our neighborhood while still viewing it through the lens of our Christian worldview. It’s so far from the typical parade you almost have to see it to “get it.” The only motorized vehicle in the parade is the obligatory police car at the beginning. Everything else is human/bicycle powered! The parade always tells a story in a few “acts.” Usually the story has something to do with protecting the earth, conserving resources, the evils of hyper-consumerism, and sometimes a jab or two at big business. There are always a number of fun musical groups — rag tag “marching bands” of local residents of all ages, a calypso band, and a couple groups of traditional Aztec drummers and dancers. The parade ends with a “free speech” section where anybody or any group can march to promote or protest anything they please. This year we left before much of that section came through. It can get a little crazy! Our kids love the crazy and beautiful costumes and the fun music. As they are getting older, it spurs all kinds of interesting questions and discussion (both the parade itself and the people gathered to watch it). Miss M asked why a particular group of people was dressed all in black. My flippant response was “oh, because they think it’s cool to do that.” Tony had a more thoughtful response, something along the lines of how people often feel they have to dress a certain way to fit in, and many people who choose to wear all black may do so because they feel like they don’t fit in or have been hurt by the culture around them. I’m glad he had such a thoughtful response, because I want my kids growing up thinking in a caring way about all the kinds of people they see around them, and how they might be able to show them the love of Jesus. To see what other bloggers are writing about for the letter M, visit this week’s Blogging through the Alphabet @ Ben and Me!